26-Mar-2004 -- After 24N 27E, this is our second Confluence during the trip from Baḥariyya to Gilf Kabīr and back. 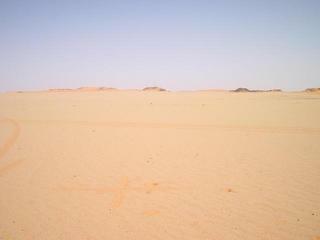 It was an eight-days desert full-immersion, no human being so far, no clues of human presence around. Khalifa Expedition backed us up to this, otherwise difficult to organize, trip. About 800 km off-road to date, breathtaking landscapes, wonderful night skies plenty of stars that you won't be able to see in Italy where we live, due to light pollution. And now, on to the next point 27N 26E.